king Llew of Har Gail, later known as Llew the Last. Old khan of Ganide led army of ten thousand back from Volbrae, confident in his strenght, never thinking that anyone would be foolish to stand in his path. Several companies of his personal guard, both mounted and dismounted, 3 regiments of imperial pike with support and countless hordes of southeners, both mounted nomads and sunburnt desert-dwellers in light arms. Armies deployed. Thessid still bunched up from waking up in the camp, TK throwing most everything as forward as possible to constraint nomad cavalry. As the Sunbull rose to sky, horns started blaring at the Thessid camp, signaling that enemy was sighted. At first khan thought this was only a minor raid to probe his strenght, but as the angowrian heavy crossbows opened fire and forced most of his guard cavalry to retreat in disarray, it dawned to him that tower kings were serious and he was in serious risk of being flanked. Khan's center, just before crossbows opened fire. As the heavy cavalry was suffering in the center, the light nomads started probing for weaknesses in enemy line - only hasty withdrawal of Euwen's main cavalry body prevented the breakthrough. Thessid left flank was secure and pressure could be applied in the center. 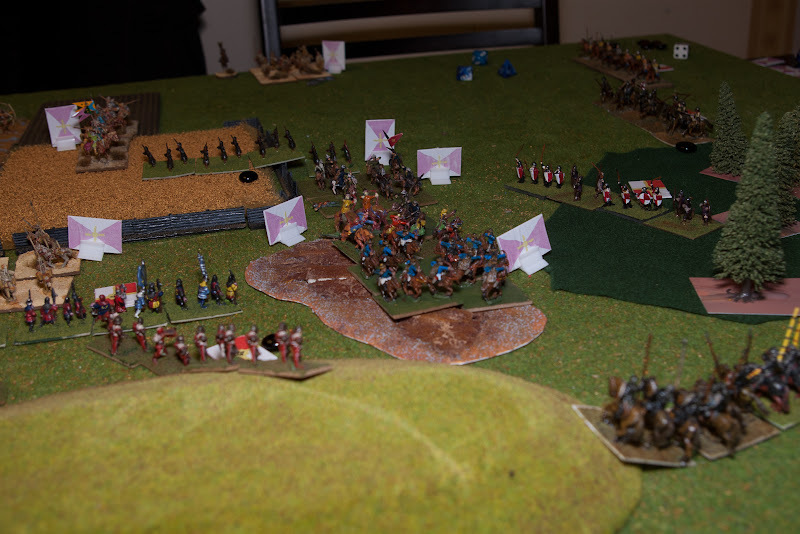 Light cavalry tries to break through. 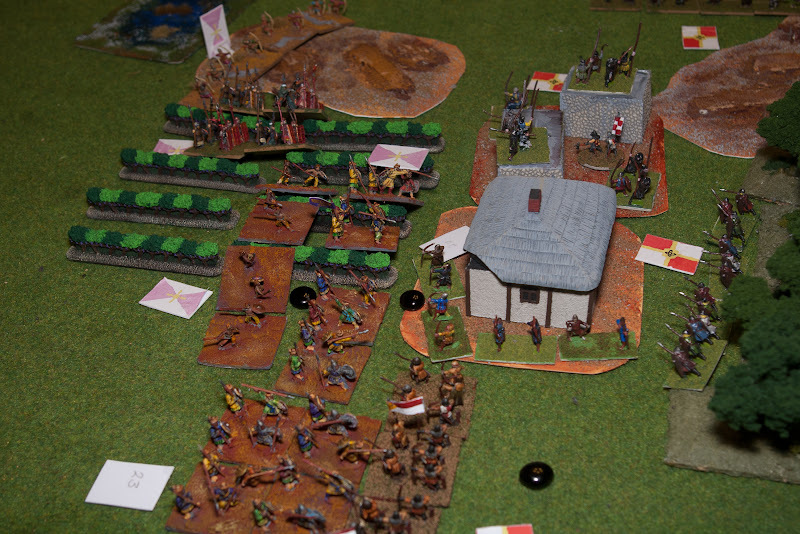 Heavy cavalry trying to get away from crossbows. 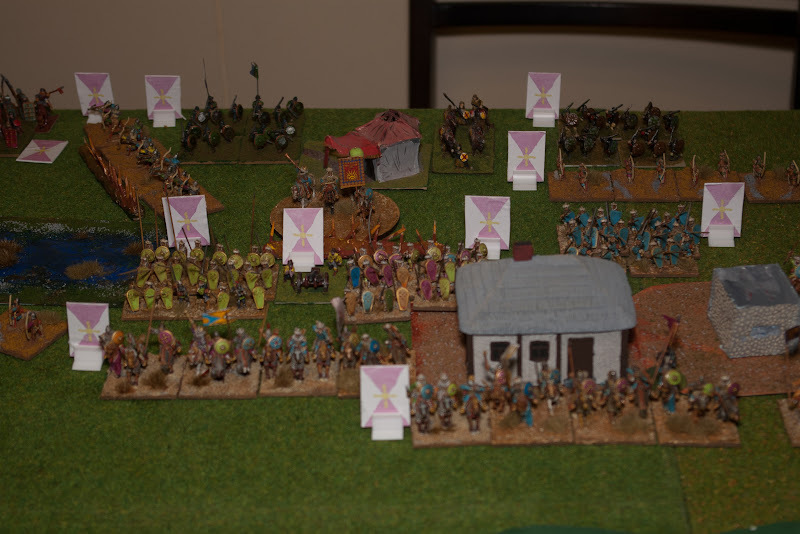 From behing the guard cavalry came the imperial pike, units of green, blue and rainbow marched forward supported by heavily armed bowmen far outreaching the crossbows. 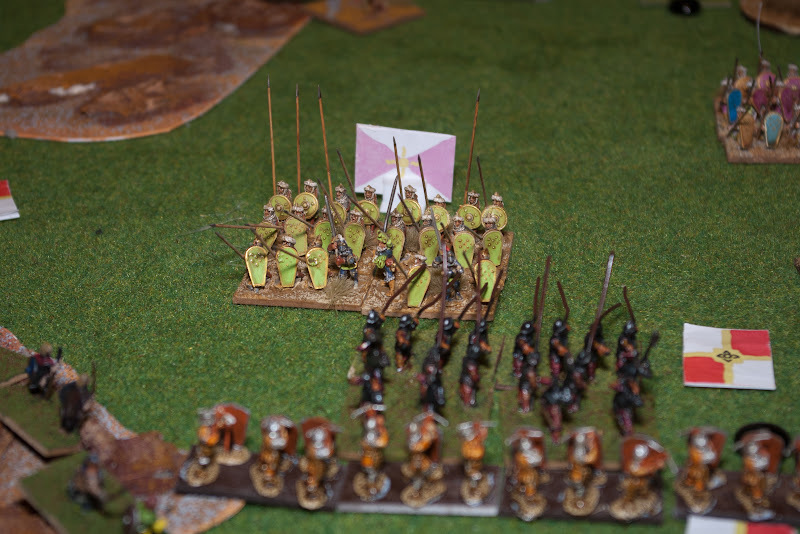 One unit of Euwen's personal guard crossbows got caught, but others wisely withdrew behing the massed lines of pikes and dismounted knights led by king of Calan Toss. Central hills saw a great clash, as the veteran knights broke the deep lines of pike. The pikes withdrew in disarray and many a proud thessid knight was taken as a hostage. 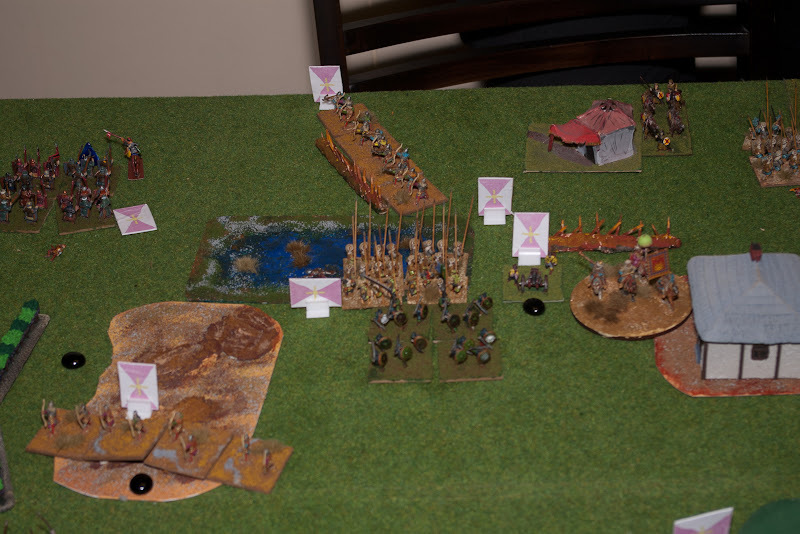 Pikes clash, daradjan mercenanies were supplied with substandard pikes, but did well. On the thessid right flanks, the desert dwellers and watchtower light troops were also gettin to grips. Spearmen led by Llew of Har Gail routed the heavier troops marching through the orchards, but his bowmen fled before the darkskinned spearmen. And on the other hand, young king Euwen had finally got himself organized and pushed his cavalry forward to flank the enemy. 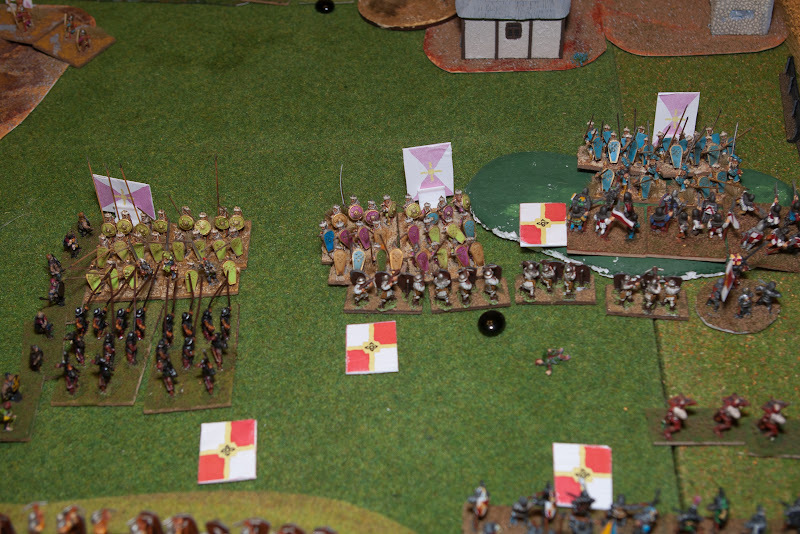 King Euwen starts to roll up the flank. last of nomads are surrounded, but go down fighting. Light troops clash, nothing conclusive. Just over an hour had the Sunbull looked down to earth as the last of the thessid center fell under marshal's attack. 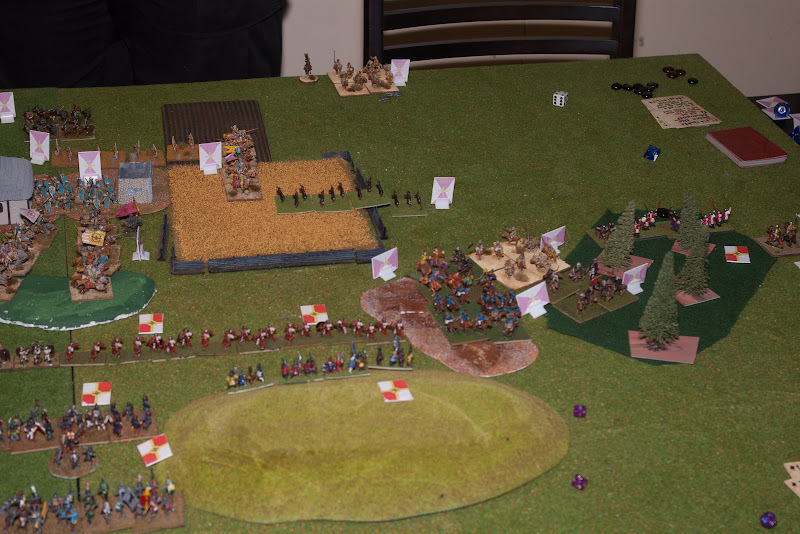 The skirmish around the orchard was still bloody and neither side was unable to gain foothold, but on the other flank Euwen was methodically rolling over any resistance, so khan was forced to recall his final reserves to cover the retreat - ever the great alchemical artillery machines were abandoned, the tower kings had achieved their greatest victory in century, wiping out the dishonor of the Black Day battle. 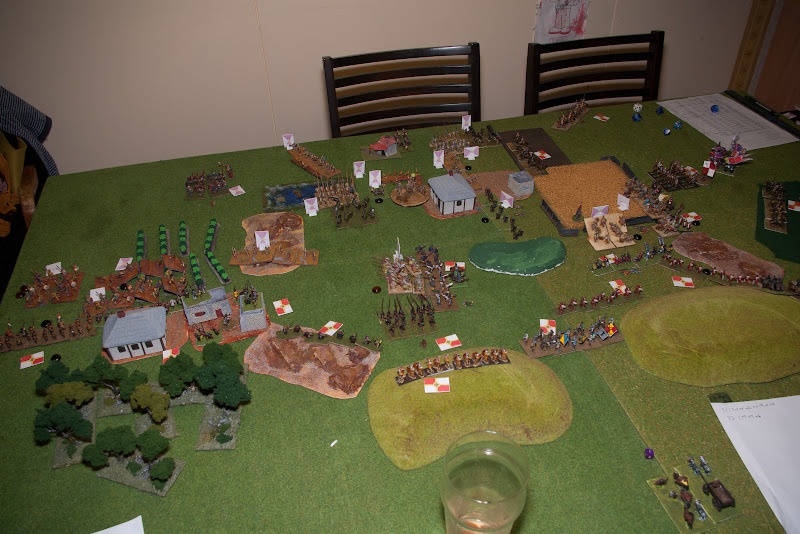 Later historian would know this battle, masterminded by wounded Mikkel as King Euwen's gambit. All in all, this was mainly a test how quickly we could play a 20+ per side game. With setup it took just under 5 hours, so quite bearable. Thessid player's cunning plan of throwing only '1's in important melees was their undoing, as the tower kings won the battle in center without almost any losses. Looking at the pictures, whole setup should have been moved a bit towards Thessid side - the idea was that scouting rolls indicated that TK army was almost able to pull off a flanking manouver before Thessid's were alert and setup areas reflected this. Now this meant that good 20% of table saw very little use. Might have been different if nomad cavalry had been able to get there, though. Nice write up and pictures; I'll look forward to seeing the story unfold! Gripping descriptions of the action. Bravo!